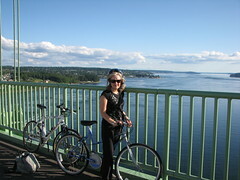 For our Sunday afternoon bike ride Esther and I rode the Scott Pierson bike trail in Tacoma. We started just on the Gig Harbor side of the bridge and followed the trail to its east terminus near Sprague Ave. The paved trail skirts Hwy 16 and only crosses a couple of streets. The weather was great and we really enjoyed the ride. Surprisingly, there were very few people on the trail, despite it being a sunny Sunday June afternoon in the middle of the city. The trail is named after a Tacoma city planner who was passionate about cycling and making Tacoma bicycle friendly. It's really quite amazing. Using the Cushman trail in Gig Harbor and the Scott Pierson trail, bicycle commuters can easily commute from Gig Harbor to downtown Tacoma or Tacoma Community College. With rising fuel prices and bridge tolls maybe it will become more popular.